Images and text (using graphic images for fonts instead of printer resident fonts) can disappear from the label when a Zebra printer is setup as a ‘smart printer’. Usually, a power cycle will cause this to occur. The “Download images…” setting available in some TEKLYNX CODESOFT embedded drivers can restore the images and text fonts to the label. When a printer is setup as a ‘smart printer’, the label design is stored in the printer memory. This typically includes all types of images. Images are sometimes pictures (logos, product pictures, etc.). However, when text is sent to the printer using a font NOT STORED in the printer (i.e. most of them), the text is ALSO sent over as a series of images. When the printer loses power, volatile memory (RAM) is lost. Thus cycling the power on the printer will result in a loss of images stored in RAM. Since the print jobs sent to the printer are relying on the images stored in the printer RAM, the label must be printed without them if the images are missing. Although this will lessen the efficiency of printing operation somewhat, the more reliable way to prevent this from happening is to resend the images with each print job. 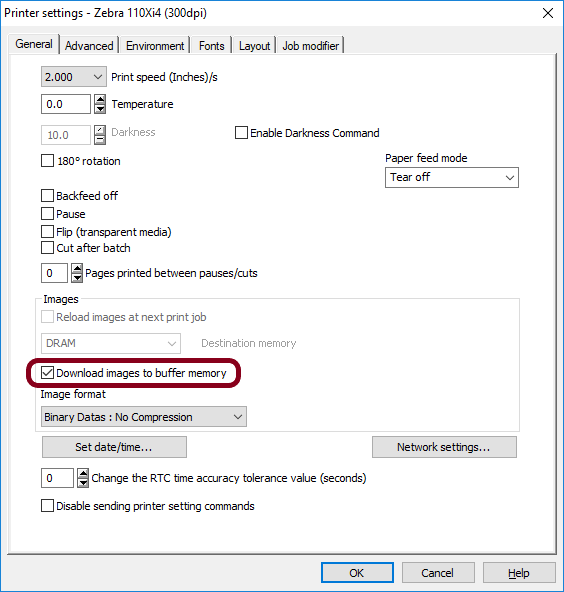 A setting available in many (but not all) TEKLYNX drivers is the “Download images to buffer memory” setting. Some TEKLYNX embedded printer drivers, for some Zebra printer (e.g.the Stripe 600) do not have the “Download images to buffer memory” option.